Meet a group of Barrington-area orthopedic surgeons for whom excellent, community-centered health care has always been a top priority, and discover how this philosophy began with one dedicated physician. Communities thrive on the strength of their assets. Good schools, convenient shopping, inviting churches, lovely parks, and a wide range of medical services attract families there in the first place. In Barrington, residents have enjoyed close, dependable service provided by highly skilled physicians and therapists at Lake Cook Orthopedics, 27401 W. Highway 22 in Barrington, for more than three decades. The practice was founded in the early 1980s by Dr. Frederick Locher, shortly after he finished his residency and entered into private practice. In a very short time, the one-doctor practice opened a second clinic to meet the community’s needs. When Young joined the practice, Barrington was still primarily agricultural, served by narrow two-lane highways. Farming can be a dangerous occupation, and many of his first patients sought treatment for traumatic injuries. Today, Lake Cook Ortho has 10 surgeons on staff, including three generalists. The team is capable of surgically treating nearly every possible orthopedic condition. Lake Cook Ortho also maintains a team of physical therapists, and provides treatment and therapy related to sports and pediatric patients. Its facilities offer the latest in imaging, from X-rays to ultrasound and MRIs. 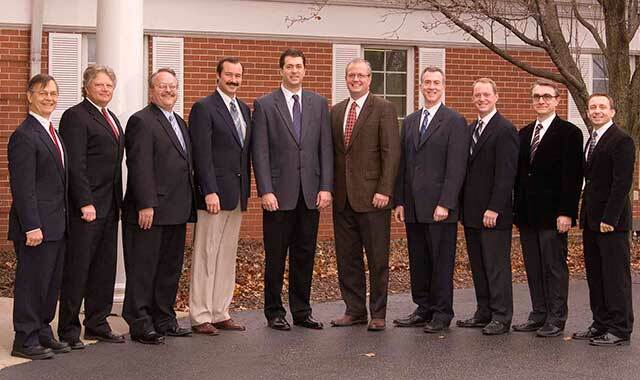 As the business has evolved, Lake Cook Ortho has maintained its original mission, to provide only the highest quality care to its patients and the Barrington community. Locher retired from the practice a few years ago, leaving it in the hands of his longtime partners. Dr. Greg Brebach, managing partner of Lake Cook Ortho and board-certified orthopedic surgeon, joined the staff in 2003. He says the practice grew out of a dedication to providing superior care. As the practice grew, it also expanded into clinics located strategically across the region. In addition to its main office, Lake Cook Ortho now operates offices in Lake Barrington (28156 W. Northpointe Pkwy. ), Lake Zurich (350 Surryse Road) and Algonquin (2294 County Line Road). Brebach grew up in Barrington and says he’s pleased to bring his medical expertise home, where he can give back to his community. Brebach is in good company. Brebach says the organization acts as a partnership, with close ties to the Barrington community. Beyond caring for its patients in the clinical setting, Lake Cook Ortho is involved in supporting the area’s Scouts and youth sports programs. Young and his colleagues serve as team doctors for the local high schools, attending games in the Barrington and Lake Zurich area. Additionally, Lake Cook supports numerous charitable organizations and events affiliated with youth sports. Brebach says he was personally excited about establishing a clinic in the Algonquin area, which he believes has significant potential for growth. While Lake Cook Ortho continues expanding its reach through our region, it stands out as a center of medical excellence. By integrating its services and doctors into vital aspects of the greater Barrington area, Lake Cook Ortho has established itself as a key factor in the region’s growth and appeal. And as need dictates, Lake Cook Ortho will continue to expand its quality orthopedic surgical and therapeutic capabilities to meet and exceed the expectations of the patients it serves. This entry was posted on Friday, May 2nd, 2014 at 11:59 am	and is filed under Northwest Business Magazine. You can follow any responses to this entry through the RSS 2.0 feed. Both comments and pings are currently closed.